A friend that I work with teaches chemistry in a school within a school. She was trying to find a lab to help students review at the end of the semester. After a little brainstorming together we decided to use an idea from Bob Worley. Last May, I wrote a blog about a titration lab. Bob had posted a comment and proposed an idea that really stuck in my head. He suggested that instead of doing a formal acid base titration, why not do it through mass instead of volume? See the video below. Apparantly, back in the day, scientists believed that once instrumentation improved, gravimetric titrations would provide better results. Since scales were not that great at the time they turned to using volumes for analysis. Using volumes works well, but why not give gravimetric analysis a try? Maybe we could also turn this into a great review of the semester content. I started by standardizing a sodium hydroxide solution of about 0.15 M with KHP. I then used the standardized sodium hydroxide solution to standardize two solutions of HCl. The two acidic solutions were about 0.20 and 0.10 M. I made 250 mL of each solution. I estimated that students could run multiple trials of titrations with these solution and I would have enough for about the next 5 years of class. Next, I made the "stand" for the berel pipette. I bought some really cheap plastic cardboard that is used for yard and election signs. I made a rectangle with a small open area in the bottom middle. I cut two slits in the rectangle and took another approximately two inch by twenty four inch piece that I bent and placed each end in the slits. This created a tripod type of stand (see figure 1). Above the cut out in the rectangle I poked some holes for plactic zip ties. I was able to slide the pipette into the ties. I also ordered some inexpenive "Hoffman clamps" to place on the fat end of the pipette (see figure 2). 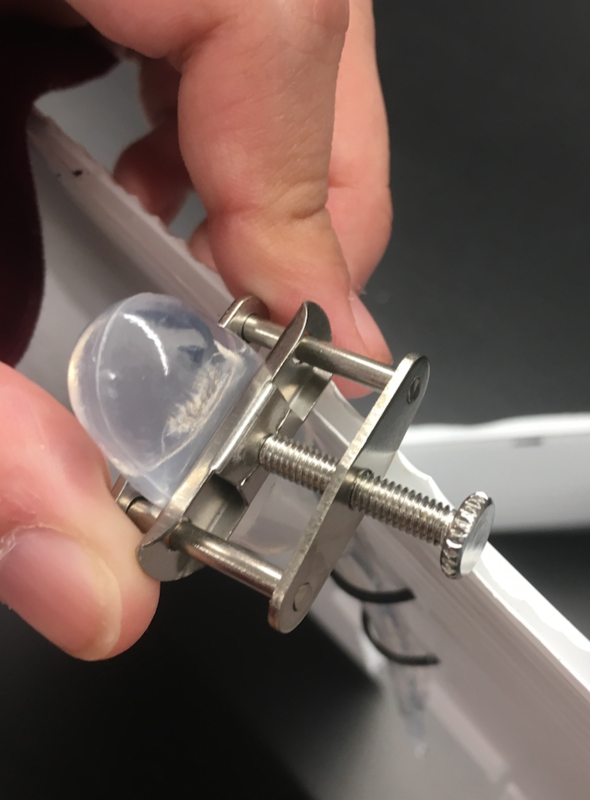 These clamps allow a student to carefully dial in the drops. The end of the pipette was pulled tight and then cut off. This made the drops much smaller. The smaller ends and the "Hoffman clamps" allows for students to carefully dial in extremely small amounts of liquid. Figure 2 - Hoffman clamp on pipette bulb. Students were instructed to obtain a small vial and put in a few drops of phenolpthalein. They were to find the mass of the vial and its contents. They then had to fill the vial about one third full with one of the two acids and record the new mass. Students then obtained the base. They filled the pipette with the special tip with the basic solution. They placed the pipette in the apparatus, added the Hoffman clamp and carefully added base to the acid until they saw the first permanant change of color. They recorded the mass of the vial and repeated the procedure for a second trial. Watch the video below to see exactly how the lab is set up. There are many ways teachers can direct students to analyze the data from this activity and use it to review the material covered over the entire semester. Here are some questions that a teacher could ask. Nomenclature - What are the formulas for the reactants and products? Reactions - Given the reactants, predict the products and write the correct balanced equation for reaction. Significant Figures - Given the masses recorded for the empty and filled vial, what is the mass of fluid added with the correct number of significant figures? Density - Given the density of the acid and base solutions their recorded masses, solve for the volume of each. Moles - Find the molar mass of KHP. If you have the grams of KHP and the molar mass of KHP, how many moles of KHP were used when the teacher standardized the base? Molarity - The molar ratio of KHP to base was 1:1. Given moles of KHP and now the moles of base along with the volume of base, what is the molarity of the base? Stoichiometry - How many moles of acid were required to react with the base? What is the molarity of the acid? How many grams of the other product should form? I am sure you could come up with more questions. This could be used as a review activity, formative assessment or possibly even a lab practical. There are many possibilities. Special Thanks - I want to note again that the set up for this was inspired by Bob Worley.